*This book is available in paperback and electronic versions. If you order the electronic version, we will send you a link where you can download versions for any eReader and a pdf. Fun Fiction for Kids who love geology, adventure and time travel. Nothing interesting ever happens in Diamond Falls, West Virginia, and that's doubly true for local teenagers Emma and Brody. Little do they know that their neighbor, a famous geologist, is about to show them the wildest time of their lives. When Mr. M's prized rock and mineral collection is destroyed before it can be displayed at the state museum, Emma and Brody jump at the chance to find new samples. The geologist accepts the offer, and promptly sends them back to the year 1775 to help! Back in time and across the pond in Derbyshire, England, Emma and Brody team with a mysterious young girl named Max to recover one of the rarest minerals in the world: Blue John Fluorite. Tapping into courage they never knew they had, the formerly ordinary West Virginians must protect a cave, avoid gun-toting soldiers, and return to the present before they're trapped forever. 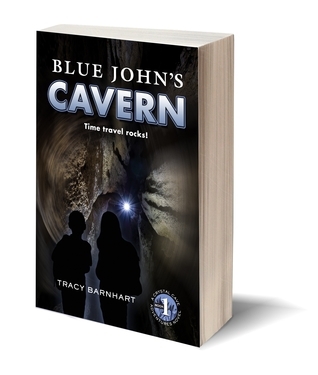 Blue John's Cavern is the first book in the middle-grade adventure/sci-fi series Crystal Cave Adventures. If you like a little excitement thrown in with your science, then you'll love Tracy Barnhart's fast-paced and compelling debut novel.